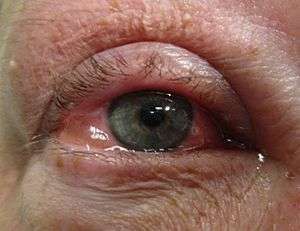 Allergic conjunctivitis is inflammation of the conjunctiva (the membrane covering the white part of the eye) due to allergy. Although allergens differ among patients, the most common cause is hay fever. Symptoms consist of redness (mainly due to vasodilation of the peripheral small blood vessels), edema (swelling) of the conjunctiva, itching, and increased lacrimation (production of tears). If this is combined with rhinitis, the condition is termed allergic rhinoconjunctivitis. The symptoms are due to release of histamine and other active substances by mast cells, which stimulate dilation of blood vessels, irritate nerve endings, and increase secretion of tears. Treatment of allergic conjunctivitis is by avoiding the allergen (e.g., avoiding grass in bloom during "hay fever season") and treatment with antihistamines, either topical (in the form of eye drops), or systemic (in the form of tablets). Antihistamines, medications that stabilize mast cells, and non-steroidal anti-inflammatory drugs (NSAIDs) are generally safe and usually effective. The conjunctiva is a thin membrane that covers the eye. When an allergen irritates the conjunctiva, common symptoms that occur in the eye include: ocular itching, eyelid swelling, tearing, photophobia, watery discharge, and foreign body sensation (with pain). Itching is the most typical symptom of ocular allergy, and more than 75% of patients report this symptom when seeking treatment. Symptoms are usually worse for patients when the weather is warm and dry, whereas cooler weather with lower temperatures and rain tend to assuage symptoms. Signs in phlyctenular keratoconjunctivitis include small yellow nodules that develop over the cornea, which ulcerate after a few days. A study by Klein et al. showed that in addition to the physical discomfort allergic conjunctivitis causes, it also alters patients' routines, with patients limiting certain activities such as going outdoors, reading, sleeping, and driving. Therefore, treating patients with allergic conjunctivitis may improve their everyday "quality of life." The cause of allergic conjunctivitis is an allergic reaction of the body's immune system to an allergen. Allergic conjunctivitis is common in people who have other signs of allergic disease such as hay fever, asthma and eczema. Most cases of seasonal conjunctivitis are due to pollen and occur in the hay fever season, grass pollens in early summer and various other pollens and moulds may cause symptoms later in the summer. Perennial conjunctivitis is commonly due to an allergy to house dust mite (a tiny insect-like creature that lives in every home). Giant papillary conjunctivitis is a very rare condition that is mainly caused by an allergic reaction to "debris". Surgery may also cause this type of allergic conjunctivitis. Contact dermatoconjunctivitis is caused by the rest of the allergens that conjunctiva may come into contact with: cosmetics, medications and so on. The ocular allergic response is a cascade of events that is coordinated by mast cells. Beta chemokines such as eotaxin and MIP-1 alpha have been implicated in the priming and activation of mast cells in the ocular surface. When a particular allergen is present, sensitization takes place and prepares the system to launch an antigen specific response. TH2 differentiated T cells release cytokines, which promote the production of antigen specific immunoglobulin E (IgE). IgE then binds to IgE receptors on the surface of mast cells. Then, mast cells release histamine, which then leads to the release of cytokines, prostaglandins, and platelet-activating factor. Mast cell intermediaries cause an allergic inflammation and symptoms through the activation of inflammatory cells. When histamine is released from mast cells, it binds to H1 receptors on nerve endings and causes the ocular symptom of itching. Histamine also binds to H1 and H2 receptors of the conjunctival vasculature and causes vasodilatation. Mast cell-derived cytokines such as chemokine interleukin IL-8 are involved in recruitment of neutrophils. TH2 cytokines such as IL-5 recruit eosinophils and IL-4, IL-6, and IL-13, which promote increased sensitivity. Immediate symptoms are due to the molecular cascade. Encountering the allergen a patient is sensitive to leads to increased sensitization of the system and more powerful reactions. Advanced cases can progress to a state of chronic allergic inflammation. Both seasonal allergic conjunctivitis and perennial allergic conjunctivitis are two acute allergic conjunctival disorders. SAC is the most common ocular allergy. Symptoms of the aforementioned ocular diseases include itching and pink to reddish eye(s). These two eye conditions are mediated by mast cells. Nonspecific measures to ameliorate symptoms include cold compresses, eyewashes with tear substitutes, and avoidance of allergens. Treatment consists of antihistamine, mast cell stabilizers, dual mechanism anti-allergen agents, or topical antihistamines. Corticosteroids are another option, but, considering the side-effects of cataracts and increased intraocular pressure, corticosteroids are reserved for more severe forms of allergic conjunctivitis such as vernal keratoconjunctivitis (VKC) and atopic keratoconjunctivitis (AKC). Both vernal keratoconjunctivitis and atopic keratoconjunctivitis are chronic allergic diseases wherein eosinophils, conjunctival fibroblasts, epithelial cells, mast cells, and TH2 lymphocytes aggravate the biochemistry and histology of the conjunctiva. VKC is a disease of childhood and is prevalent in males living in warm climates. AKC is frequently observed in males between the ages of 30 and 50. VKC and AKC can be treated by medications used to combat allergic conjunctivitis or the use of steroids. Maxwell-Lyons sign, shield ulcer, cobblestones papillae, gelatineous thickening at the limbus, and Horner-Trantas dots are specific features of vernal type. Giant papillary conjunctivitis is not a true ocular allergic reaction and is caused by repeated mechanical irritation of the conjunctiva. Repeated contact with the conjunctival surface caused by the use of contact lenses is associated with GPC. PKC results from a hypersensitivity/inflammatory reaction to bacteria. Common pathogens include Staph. aureus, Mycobacterium tuberculosis, Chlamydia and Candida. A detailed history allows physicians to determine whether the presenting symptoms are due to an allergen or another source. Diagnostic tests such as conjunctival scrapings to look for eosinophils are helpful in determining the cause of the allergic response. Antihistamines, medication that stabilizes mast cells, and non-steroidal anti-inflammatory drugs (NSAIDs) are safe and usually effective. Corticosteroids are reserved for more severe cases of ocular allergy disease, and their use should be monitored by an eye care physician due to possible side-effects. When an allergen is identified, the person should avoid the allergen as much as possible. If the allergen is encountered and the symptoms are mild, a cold compress can be used to provide relief. 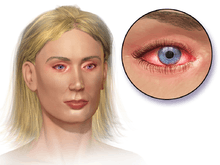 This is another form of conjunctivitis that is usually caused by cosmetics and pollen which are made of or contains a little or high quantity of alcohol. This is common in people with asthma and eczema. It can lead to mild which makes the eye itchy, red and sore. It could be seasonal conjunctivitis which may last for a few weeks or it may be consistent if the individual is allergic to alcohol. However, individuals who have his type of conjunctivitis usually gave a high chance of beating the condition and also eliminating their future exposure to allergens. By avoiding the allergen, the severity of its symptoms can be reduced send also remove the condition depending on how effective such individual is in his/her avoidance procedures. The most effective way to experience relief from all sorts of allergy-related conditions is to make use of eye allergy drops. This happens to be the best way to treat all eye allergies. However, these drops are considered safe and effective due to the fact that they help to treat and relieve allergies in the eye which are often characterized by constant itches, sneezing, red and painful eyes. Twin effectiveness comes from the fact that they can be used without the fear of any side effects which are often encountered with the use of other less conventional healing procedures. Mast cell stabilizers can help people with allergic conjunctivitis. They tend to have delayed results, but they have fewer side-effects than the other treatments and last much longer than those of antihistamines. Some people are given an antihistamine at the same time so that there is some relief of symptoms before the mast cell stabilizers becomes effective. Doctors commonly prescribe lodoxamide and nedocromil as mast cell stabilizers, which come as eye drops. A mast cell stabilizer is a class of non-steroid controller medicine that reduces the release of inflammation-causing chemicals from mast cells. They block a calcium channel essential for mast cell degranulation, stabilizing the cell, thus preventing the release of histamine. Decongestants may also be prescribed. Another common mast cell stabilizer that is used for treating allergic conjunctivitis is sodium cromoglicate. Antihistamines such as diphenhydramine and chlorpheniramine are commonly used as treatment. People treated with H1 antihistamines exhibit reduced production of histamine and leukotrienes as well as downregulation of adhesion molecule expression on the vasculature which in turn attenuates allergic symptoms by 40–50%. Dual-action medications are also prescribed frequently. Olopatadine (Patanol) and ketotifen fumarate (Alaway or Zaditor) both provide protection by acting as an antihistamine and a mast cell stabilizer together. Patanol is a prescription medication, whereas ketotifen fumarate is not. Many of the eye drops can cause burning and stinging, and have side-effects. Proper eye hygiene can improve symptoms, especially with contact lenses. Avoiding precipitants, such as pollen or mold can be preventative. Allergen immunotherapy (AIT) treatment involves administering doses of allergens to accustom the body to substances that are generally harmless (pollen, house dust mites), thereby inducing specific long-term tolerance. Allergy immunotherapy can be administered orally (as sublingual tablets or sublingual drops), or by injections under the skin (subcutaneous). Discovered by Leonard Noon and John Freeman in 1911, allergy immunotherapy represents the only causative treatment for respiratory allergies. Experimental research has targeted adhesion molecules known as selectins on epithelial cells. These molecules initiate the early capturing and margination of leukocytes from circulation. Selectin antagonists have been examined in preclinical studies, including cutaneous inflammation, allergy and ischemia-reperfusion injury. There are four classes of selectin blocking agents: (i) carbohydrate based inhibitors targeting all P-, E-, and L-selectins, (ii) antihuman selectin antibodies, (iii) a recombinant truncated form of PSGL-1 immunoglobulin fusion protein, and (iv) small-molecule inhibitors of selectins. Most selectin blockers have failed phase II/III clinical trials, or the studies were ceased due to their unfavorable pharmacokinetics or prohibitive cost. Sphingolipids, present in yeast like Saccharomyces cerevisiae and plants, have also shown mitigative effects in animal models of gene knockout mice. Allergic conjunctivitis occurs more frequently among those with allergic conditions, with the symptoms having a seasonal correlation. Allergic conjunctivitis is a frequent condition as it is estimated to affect 20 percent of the population on an annual basis and approximately one-half of these people have a personal or family history of atopy. Giant papillary conjunctivitis accounts for 0.5–1.0% of eye disease in most countries. The Allergic Alсоhоl from the original on 30 April 2012. Retrieved 2010-04-08. 1 2 3 4 Bielory L, Friedlaender MH (February 2008). "Allergic conjunctivitis". Immunol Allergy Clin North Am. 28 (1): 43–58, vi. doi:10.1016/j.iac.2007.12.005. PMID 18282545. 1 2 3 4 5 6 7 8 9 10 11 12 13 14 15 Ono SJ, Abelson MB (January 2005). "Allergic conjunctivitis: update on pathophysiology and prospects for future treatment". J. Allergy Clin. Immunol. 115 (1): 118–22. doi:10.1016/j.jaci.2004.10.042. PMID 15637556. 1 2 3 4 5 Whitcup SM (2006). Cunningham ET Jr; Ng EWM, eds. "Recent advances in ocular therapeutics". Int Ophthalmol Clin. 46 (4): 1–6. doi:10.1097/01.iio.0000212140.70051.33. PMID 17060786. 1 2 Allansmith M.R. ; Ross R.N. (1991). "Phlyctenular keratoconjunctivitis". In Tasman W.; Jaeger E.A. Duane's Clinical Ophthalmology. 1 (revised ed.). Philadelphia: Harper & Row. pp. 1–5. ↑ "Conjunctivitis (inflammation of the eye)". netdoctor.co.uk. Archived from the original on 15 April 2010. Retrieved 2010-04-06. ↑ "What is conjunctivitis?". patient.info. Archived from the original on 30 April 2010. Retrieved 2010-04-06. ↑ Liu G, Keane-Myers A, Miyazaki D, Tai A, Ono SJ (1999). "Molecular and cellular aspects of allergic conjunctivitis". Chem. Immunol. Chemical Immunology and Allergy. 73: 39–58. doi:10.1159/000058748. ISBN 3-8055-6893-2. PMID 10590573. 1 2 3 4 Buckley RJ (December 1998). "Allergic eye disease—a clinical challenge". Clin. Exp. Allergy. 28 (Suppl 6): 39–43. doi:10.1046/j.1365-2222.1998.0280s6039.x. PMID 9988434. 1 2 3 Sun, W. Y.; Bonder, C. S. (2012). "Sphingolipids: A Potential Molecular Approach to Treat Allergic Inflammation". Journal of Allergy. 2012: 1. doi:10.1155/2012/154174. PMC 3536436 . PMID 23316248. ↑ Rosenwasser LJ, O'Brien T, Weyne J (September 2005). "Mast cell stabilization and anti-histamine effects of olopatadine ophthalmic solution: a review of pre-clinical and clinical research". Curr Med Res Opin. 21 (9): 1377–87. doi:10.1185/030079905X56547. PMID 16197656. ↑ Avunduk AM, Tekelioglu Y, Turk A, Akyol N (September 2005). "Comparison of the effects of ketotifen fumarate 0.025% and olopatadine HCl 0.1% ophthalmic solutions in seasonal allergic conjunctivities: a 30-day, randomized, double-masked, artificial tear substitute-controlled trial". Clin Ther. 27 (9): 1392–402. doi:10.1016/j.clinthera.2005.09.013. PMID 16291412. ↑ "Conjunctivitis – Epidemiology, Diagnosis, Treatment and management". encyclopedia.stateuniversity.com. Archived from the original on 9 April 2010. Retrieved 2010-04-06. ↑ "Conjunctivitis: Differentiating Allergic, Bacterial & Viral Conjunctivitis". conjunctivitis.blogspot.com. Retrieved 2010-04-06.